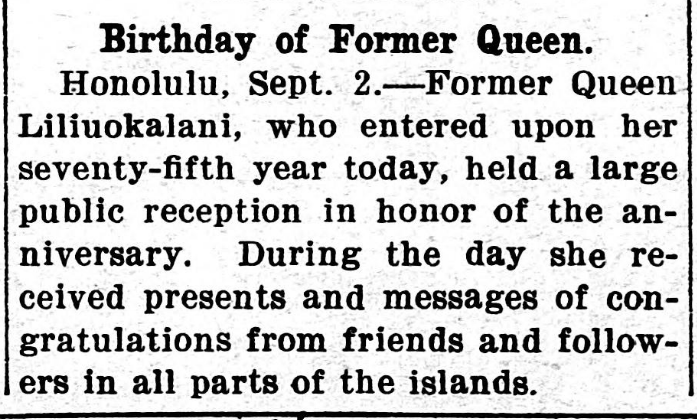 All of Hawaii was talking about Queen Liliuokalani’s 75th birthday, 1913. In accordance with this day being Queen Liliuokalani’s 75th birthday, her loyal subjects and old friends under her former administration, and even those of foreign birth, on this day from 11 o’clock in the morning to 12 o’clock, for 1 hour at Washington Palace on Beretania Street, they will be given audience; and at the imperial villa on the seaside of Wakiki will be held a grand celebration. More on Liliu’s 75th birthday, 1913. This past Tuesday, the 2nd of September, was the birthday of Queen Liliuokalani; she has been living in this world 75 years, and she is the only reigning queen of Hawaii that has almost reached extreme age. There was a royal audience that day as was done regularly in the years past, at her home at Washington Place [Wakinekona Hale], before noon; there were many friends and Hawaiian citizens of the queen who went to see her on that day. Princess Kawananakoa assisted her in welcoming the friends and citizens, and Colonel C. P. Iaukea introduced the friends before her, and Mr. E. K. Lilikalani escorted the malihini into the house. The Royal Hawaiian Band [Bana Hawaii] was there entertaining the audience while they all were visiting the queen; there were many old songs, songs which the queen took great delight in while she reigned and mele that were sung in the days of King Kalakaua. Ka Nupepa Kuokoa, Buke LI, Helu 35, Aoao 2. Sepatemaba 5, 1913. Queen Liliuokalani celebrates 75 years old, 1913. 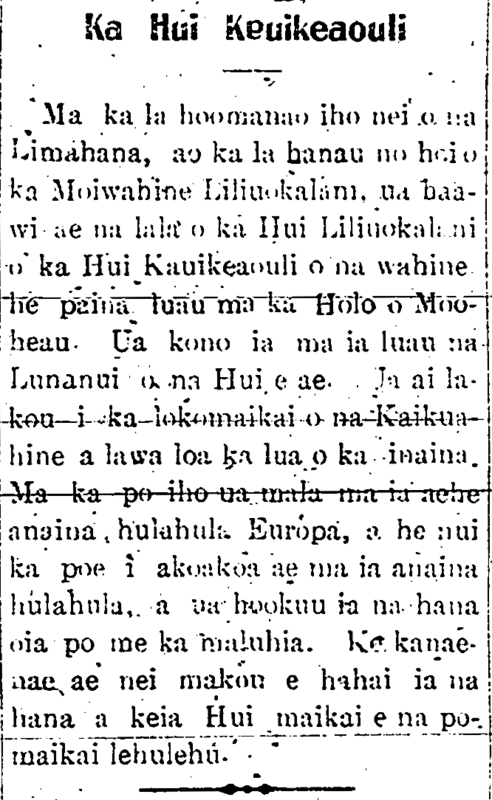 Ka Nupepa Kuokoa, Buke LI, Helu 35, Aoao 1. Sepatemaba 5, 1913. North Dakota reports on Liliu’s birthday, 1913. 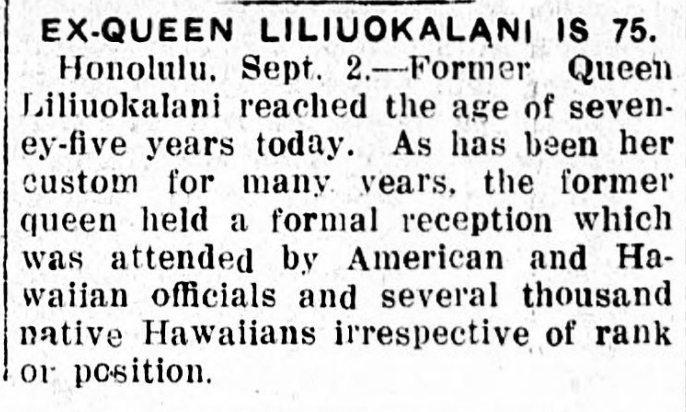 Honolulu, Sept. 2.—Former Queen Liliuokalani reached the age of seveney-five years today. As has been her custom for many years, the former queen held a formal reception which was attended by American and Hawaiian officials and several thousand native Hawaiians irrespective of rank or position. Bismark Daily Tribune, Thirty-Third Year, Number 208, Page 8. September 3, 1913. And Virginia also reports Liliu’s birthday on the front page, 1911. Honolulu, Sept. 2.—Former Queen Liliuokalani reached the age of 73 years today. In accordance with her custom the former Queen celebrated the anniversary by holding a large public reception. Staunton Spectator and Vindicator, Volume 91, Number 23, Page 1. September 8, 1911. Liliu’s birthday reported in far away Minnesota, 1912. Honolulu, Sept. 2.—Former Queen Liliuokalani, who entered upon her seventy-fifth year today, held a large public reception in honor of the anniversary. During the day she received presents and messages of congratulations from friends and followers in all parts of the islands. The Bemidji Daily Press, Volume 10, Number 108, Page 1. September 2, 1912. More celebrating of the Queen’s 74th birthday, 1912. On this past Labor Day, the birthday of Queen Liliuokalani, the members of the Liliuokalani Society and the women of the Kauikeaouli Society gave a luau at Mooheau Hall. Invited to that luau were the heads of the other Societies. They partook of the kindness of the Sisters until their stomachs were filled [ua lawa loa ka lua o ka inaina]. The following night, a European dance was held and many people assembled there, and the event that night was let out peacefully. We pray that the ways of this Society will be followed for the good of the public. Ka Hoku o Hawaii, Buke 7, Helu 14, Aoao 3. Sept. 5, 1912.